Check out this Historic, VERY FIRST X-Men character design sheet that Chris Bachalo drew when he started drawing the Uncanny X-Men comic book series back in the late 1990's. This full body pinup of ICEMAN is drawn on an 11 by 17 inch Marvel art board. These designs kicked off the look for the X-Men team for many years to come. A nice slice of Marvel history! 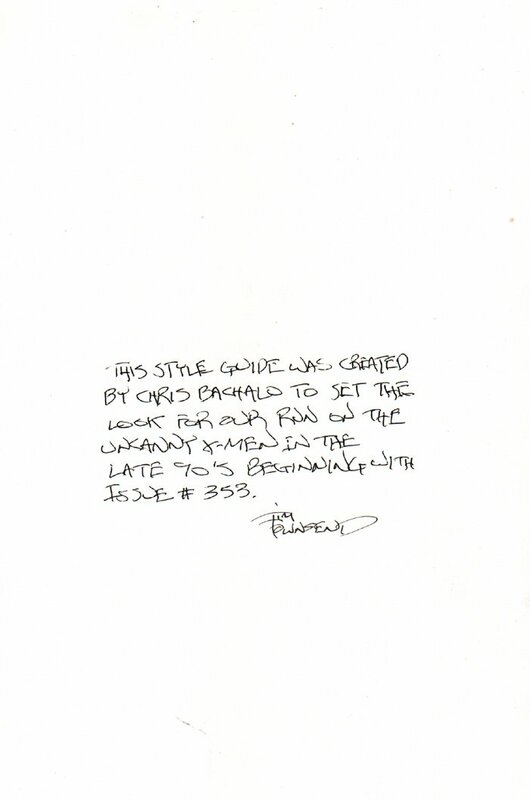 Click on the RED LINK above to see what Marvel inker Tim Townsend wrote on the back of this art board which reads: "THIS STYLE GUIDE WAS CREATED BY CHRIS BACHALO TO SET THE LOOK FOR OUR RUN ON THE UNCANNY X-MEN IN THE LATE 90'S BEGINNING WITH ISSUE #353." Signed by Tim Townsend! Just a neat HISTORIC piece of art for any serious X-Men collector!